Mike Nichols just wanted to make a talking banana. A self-described inventor of “useless” things, his original goal was to create an interactive robot for his Twitch viewers to play with. Whatever they typed into chat, the banana would say—while dancing! Then the trolls showed up. Content warning: this article contains references to the n-word. Nichols learned the hard way what many Twitch streamers who employ text-to-speech technology already knew: assholes really like to try to manipulate programs into saying the n-word. Or even just things that sound like the n-word. As long as there’s a chance they’ll get the banhammer dropped on a streamer’s head, they’re not too picky. And given Twitch’s history of banning channels for saying the n-word, there’s a very good chance indeed. 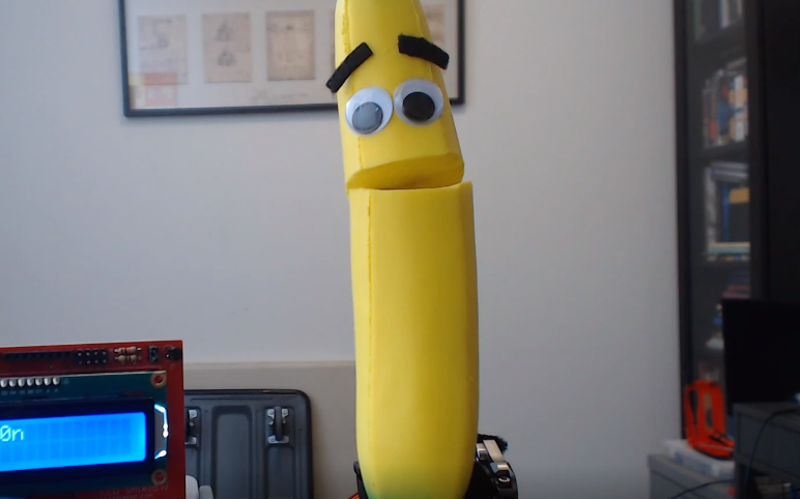 The banana channel is pretty much what it sounds like: the banana is positioned in front of a camera, and while it moves back and forth to music, people can enter phrases into Twitch chat—which it will then read out loud. One night a couple months ago, Nichols’ channel’s concurrent viewer count suddenly shot up to 600, which is a lot for a relatively small channel. Nichols realized the channel had been raided by the community of a popular streamer, but he didn’t think much of it. “I decided to just leave the stream on and go to sleep,” he said in a video about the banana uploaded to YouTube this week. The streamer in question was Greekgodx, whose “GGX gang” is one of the more notoriously troll-y communities on Twitch. Greekgodx himself pointed his viewers to the channel, but dipped out when things started getting racist. Members of his community stuck around, though, and made the banana sing and dance to a series of increasingly vile tunes. Among other things, they made it spell out the n-word. The next day, Nichols found that his banana had been banned from Twitch. He found that Twitch trolls had used accented characters to get around the banana’s filter, using fake words like “knìgár” to defuse the banana’s defenses. While waiting for the ban to end, Nichols tweaked the banana’s code so that it would remove accented characters and added the words the GGX gang had come up with to his filter list. Problem solved? Of course not. Once the banana was back up, the GGX gang were like Vegas magicians with their use of dehumanizing language: tricks up every sleeve and other crevices besides. Thus began an arms race that spanned days. Nichols says that the trolls switched to another tried-and-true Twitch tactic: spamming the word, except with the first letter at the end instead of the beginning so that—thanks to rapid repetition—it would still sound like the banana was saying it. A demonstration of one of the ways trolls got around the banana’s language filter. It didn’t end there, either. Trolls proceeded to spam innocuous words like “Snickers,” which—when repeated ad nauseam—sounds like the n-word. So Nichols added words like that to the filter. But the trolls kept trying to turn the banana into their racist mannequin. Next, they went with combinations of innocuous words like “Disney Gurs” and “Bernie Curs.” Warning: do not trying saying those phrases out loud. The banana did, and Nichols told Kotaku that he was “lucky” that Twitch admins didn’t notice, or he’d have probably gotten banned again. Ever since the end of March, Nichols says the GGX gang hasn’t been able to bust through the new filter, no matter how much they’ve beaten their multifarious, hydra-like heads against it.